Thane has these couple of places, small little food joints which sprinkle some magic ingredients on their food. The menu consists of the most simple and highly addictive food items. Being a Thaneite I am a regular at these enticing joints. Starting with my favourite- Misal Pav. And when you say Misal in Thane it has to be The Mamledar Misal. This humble joint with a tin roof right outside the Tehsildar office, off talao pali signal needs no introduction. From commoners to celebrities and politicians everybody is a fan. Their misal comes in three categories normal, medium and very "tikha". Well, the names are completely misleading cause even the so called normal will have smoke coming out of your ears. 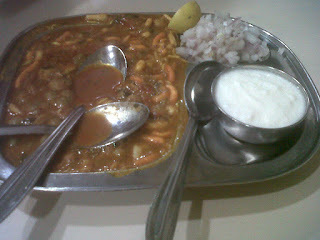 Its the most "zanzanit" misal you'll ever have. On the misal base they pour hot spicy boiling oil called as "tari". You can top it up on your misal as many times as you like. With the tari, lemon and onion this misal undoubtedly tastes like the best misal. 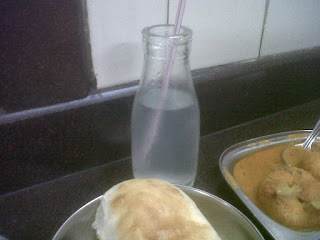 They also serve buttermilk which feels like a blessing immediately after having the misal. Once you have this, the bar is set so high that you will not settle for any other misal. For the courageous foodies who are ready to face "the morning after" experience, give it a try I say. :P (tip- closed on Sunday) Will do some happy clicking the next time I am there. Another eatery in the prime locality on Gokhale road is Durga Snacks. Famous for its nimbu-pani, vada pao and misal its like the ideal snack joint. Enjoy a breakfast here or walk in for a quick bite while shopping on Gokhale road. There is no sitting arrangement and if you are lucky enough to get in you can place your plate on the table while eating. The service is quick and the food hot. This place is crowded and you may have to stand outside trying to hold and eat your food at the same time which is a task. I happened to find place inside and went in for a misal and medu vada with nimbu-pani of course. I totally recommend their vada pav and steaming hot idlis. Posting some pictures here. Please ignore the poor picture quality, the food is totally awesome and this is one place where foodies must stop.